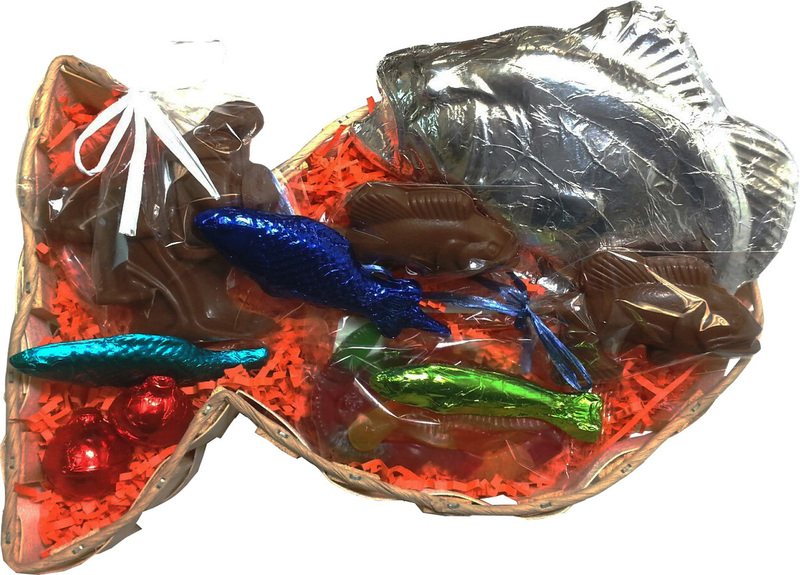 Unique fish shaped wooden gift basket with an assortment of handmade fishing-related themed chocolates. Contains chocolate XXL jumping fish, chocolate fishing bobbers, large chocolate jumping fish on a stick, chocolate minnows, straight fish on a stick, chocolate chocolate XL fishing reel Makes a great food or hostess gift for fishing or resort companies or offices..
Includes up to 4 color process imprinted label attached to the clear shrink wrap.. Available in: milk or dark chocolate versions or assorted milk and dark chocolate items.